↑ Prefixes for vehicle registration were introduced in 1906, but often changed due to the political changes after 1945. Vehicles were registered under the following prefixes: "I A" (1906 – April 1945; devalidated on 11 August 1945); no prefix, only digits (from July to August 1945), "БГ" (=BG; 1945–46, for cars, lorries and busses), "ГФ" (=GF; 1945–1946, for cars, lorries and busses), "БМ" (=BM; 1945–47, for motor bikes), "ГМ" (=GM; 1945–1947, for motor bikes), "KB" (i.e. : Kommandatura of Berlin; for all of Berlin 1947–48, continued for West Berlin until 1956), "GB" (i.e. 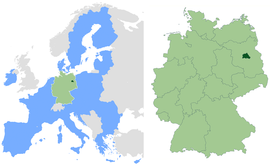 : Greater Berlin, for East Berlin 1948–53), "I" (for East Berlin, 1953–90), "B" (for West Berlin from 1 July 1956, continued for all of Berlin since 1990). This page was last edited on ११ फेब्रुवरी २०१८, at १०:५०.